It’s like hitting the refresh button for conferences, big time. It has to be done. It has to be read. Bye bye boring, unproductive meetings. Kiruba takes us on a fascinating tour of unconventional yet effective methods for achieving the most from collaborative group sessions. 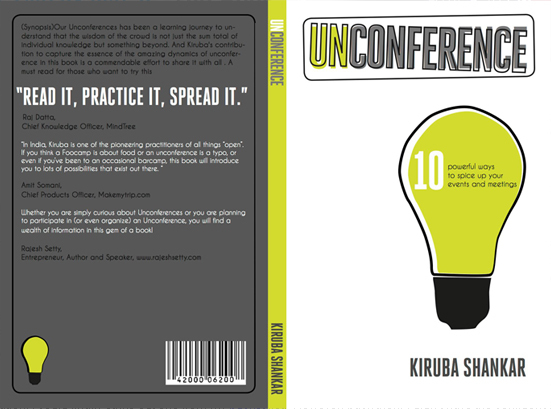 I gained a valuable new perspective by reading unconference and will use a number of the techniques Kiruba describes in sessions with clients, partners and internal staff. I attend dozens of conferences every year and I’m bored of the traditional lecture with PowerPoint. At any industry event, the audience will have more collected knowledge than a single speaker. It makes sense to use that knowledge through the techniques Kiruba describes in this book. Read, learn and enjoy! In a business world, where meetings are getting irrelevant, conferences a bore and conventions leave us wanting for more, the ‘Unconference’ came as a breath of fresh air. I was fortunate to attend the first of the few Un-conference organised by Kiruba. It was like attending college for a day, where only my favorite teachers were presenting with my very best of friends there in class with me. Wait a go, Kiruba for trail-blazing this format and codifying it in this book so that it becomes more main-stream. Mr. Shankar´s work helps solving an important issue: audiences often know as much (or more) than the speakers in a conference. So, how to create an environment where the knowledge present in a group can be truly shared? His more than two dozen “unconference” are a good answer to that question, making you think about the evolution of group discussions, and how the traditional conference model is in need to evolve to a more read/write format. Kiruba being a practitioner of unconference, his masterful work brings clarity and understanding of unconference. It is a superb guide to unconference. I highly recommend it. Whether you are simply curious about unconference or you are planning to participate in (or even organize) an Unconference, you will find a wealth of information in this gem of a book! In India, Kiruba is one of the pioneering practitioners of all things “open”. If you think a Foocamp is about food or an unconference is a typo, or even if you’ve been to an occasional barcamp, this book will introduce you to lots of possibilities that exist out there. In 2004, I came across FooCamp, an invite-only, camping style meetup of great minds in Sebastapool, California. The event was restricted to the who’s who of the brilliant people doing cutting edge work. Its an event that I can only dream to be part of. However, I fell in love with the format of casual networking and learning from each other. In 2005, when I began to hear about BarCamp and how it aimed to do a more democratic, inclusive version of FooCamp, I was fascinated. The fact that anyone who has the interest can organize one without the need for licensing caught my fancy. I took up the initiative to organize BarCamp Chennai in 2006 along with other passionate volunteers (who have now become very good friends). The success and the joy of organizing this event totally changed my perspective of events. Some of the best talks at the event did not come from CXOs but from youngsters who would never have stood a chance to talk at any major conference. Everyone had a role to play in the event. People took up responsibilities. There were not attendees. They were participants. They felt ownership towards the event.. I’ve organized many events but never felt the joy I felt at this event. To me, this was an eye-opener.